Ever wonder what your dog is thinking and wish you had an insider's knowledge to his or her innermost thoughts? Well, one company is claiming that you will soon be able to with new, wearable technology designed to inform pet owners of their dog's emotional status. 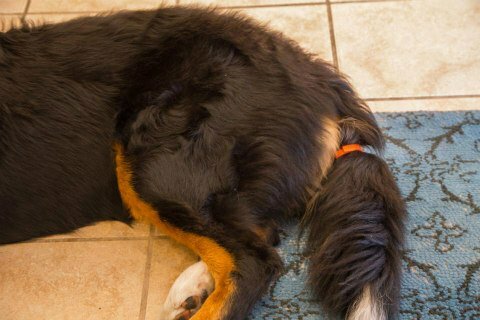 It's called TailTalk, and it's a sensor that allegedly monitors and records your dog's body language in order to give you, the pet owner, a deeper understanding of how they feel. Your pet wears the smart device at the base of its tail and their wagging does the rest. The gadget resembles an adjustable silicone-rubber flea collar and it claims to decode and then translate data delivered through a companion app for iOS and Android devices using Bluetooth. Whether it sounds like complete hokum or not, DogStar Life is the New York-based tech company behind the upcoming product that claims the key to understanding a dog’s happiness is its tail. Whereas most of us assume a dog's wagging tail simply implies they're happy — for whatever reason — Pamela Perry, a veterinary behavior resident at Cornell University, said tail wagging does not automatically indicate that particular state of mind. Apparently, there are many nuances to the action itself that dogs readily understand but humans do not. And here all this time we thought of man's best friend as being so uncomplicated when in reality they're not -- or so entrepreneurs of pet products would have us believe. Co-founders Mike Karp and Yannis Tsampalis began work on the project back in 2014 while pursuing MBAs at New York's Cornell Tech. Their hope is the information gathered from this wearable technology will allow pet owners to expand on or emphasize the triggers that bring their pets the most joy, while at the same time avoiding stress inducers. Some of those triggers might include people, places, toys, other animals, isolation, crowds and various other factors we take for granted. The duo is currently working with the College of Veterinary Medicine at Cornell University where they are in the process of setting up clinical trials. They and other researchers believe wagging isn't just wagging. That it's asymmetric and includes complex emotional signals that we, as humans, have thus far failed to pick up on. These beliefs are based on scientific research that’s been conducted over the last few years in the academic world on what tail movements really mean. So far, participants of these studies believe that wagging to the left is indicative of negative feelings like anger and aggression. Wagging to the right, on the other hand, is significant for positive feelings such as happiness and/or excitement. 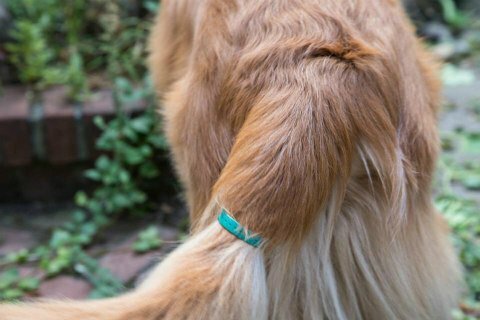 The findings go on to say tail movements convey much more meaning to other canines who are better able to pick up on these subtle signals than their obtuse owners who cannot. This really isn't surprising, as most laypeople have long suspected or known that dogs and other animals have their own language they rely on to convey their feelings and intentions. If you're wondering about the research behind the upcoming smart device, it was led by Professors Giorgio Vallortigara and Angelo Quaranta from the University of Bari, Italy. Their peer-reviewed, published study centered around the direction of a tail's wag and how it translates into canine emotions. The information gathered will work in conjunction with the DogStar app to permit pet owners to follow how their dogs are feeling during waking moments, whether you're with them or not. This insight could make it easier to understand whether your pet is anxious or lonely when you're gone. It might even be able to paint a clearer picture of why they're uprooting your flower bed, digging in the trash or ripping the mail apart as it comes in through the slot. Are they angry or happy is the big question on everyone's mind. Think of it as a dog diary that your furry friend has unwittingly shared with you. Through the app you will create a profile for your dog or dogs — yes, you can use it with more than one pooch as long as they all have sensors attached — and from there you will be given data in connection to their overall happiness score based on the day, week or month. There's even an emotional graph for quick reference to their recorded feelings and an events and reminders calendar for organizing and tracking your pup's busy schedule with alerts and reminders. If your dog has BFFs, there's a category for that on the dashboard, too. Why you'd need that information is anyone's guess, but it is or soon will be available. DogStar Life has created an IndieGoGo campaign for crowdfunding in order to get their new invention up, running and out the door to interested buyers. With the support of the public, they hope to have TailTalk technology available for shipment between July and October of 2016. If this sounds like a worthwhile project with huge potential for actual insight into a dog's mind and resultant behavior, you can support the concept on their IndieGoGo page here. If this is something you'd be interested in someday owning, contributors can put in their orders there as well. Their goal is for dog owners to one day be able to better understand their pet's needs in order to act on them appropriately and possibly create a stronger bond between them. If the concept is on the up and up and everything pans out, hopefully the sale of the product will make possible further research to better understand our animal companions in the future. Goldfish Beauty Pageant - What? No Swimsuit Competition?